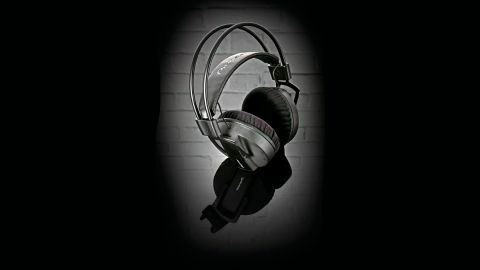 Professional quality headphones for studio set-ups at all levels, with dynamic and detailed sound. Not for use in the booth. Pioneer has long been serving the DJ market with their HDJ headphones range, where the emphasis is on durability, highlighting the key sonic elements of a mix and screening out background noise. With the HRM-7 they are stepping into the studio with their focus on dance music producers. Of course, the monitoring needs of producers/engineers are much the same whatever the genre: accuracy across a wide dynamic and spectral range. The HRM-7s are large, definitely not 'in the booth' material, and not designed for portability. They are lighter than they look, comfy to wear, even for long periods, and as a circumaural design cover the ears without any undue pressure. In fact, they sit on the head so effortlessly we kept thinking they might fall off, but they didn't. We wouldn't recommend them for drummers or any active studio performer as a bit of dancing about may send them flying. The cable is detachable and single sided (left-hand side) with coiled and straight versions included in the box. There are the obligatory (at this price) spare ear pads, so there's years of usage covered before hunting down spares, so long as you don't blow the drivers. Inside the HRM-7s is a pleasing aural world, aided by the comfortable design, and the immediate impression is of clarity in all directions; stereo separation is excellent (no noticeable physical coupling via headband), dynamic range is undistorted even at high volume, and the frequency range extends to the limits of our hearing without any audible shelving off. Headphones can be a good way to judge bass when the available monitors don't reach down too far, and in this regard the HRM-7s don't disappoint. There's no hyping, just a clear picture of what's going on down low. The low-mid and mid range are crucial for the real meat in any mix, and it can be easy to make a mess here without decent monitoring. The HRM-7s present the detail in this range accurately; no carving out or pushing forward which are often the side effects of bass-hyped or bass light designs (respectively). The airy top, ie 15kHz and up, is all present and correct so you can control the 'twinkle' without second guessing. The upper mid/early high range ( 5kHz) is a little overrepresented for our taste, which makes us mix this region too far back. Obviously this is a subjective analysis as we are super (over) sensitive in this area (we compensate when mixing), and maybe this is part of the Dance music focus. Are Dance music producers more prone to insensitivity in this range due to exposure to cranked DJ headphones and too many cymbals, risers and breathy vocals through club rigs?! On the other hand, it does make you very aware of what is going on in and around our more sensitive frequency region. The separation from external sources afforded by these headphones is good, similar to my DT770s. This means jumping between cans and speakers doesn't have to involve switching monitor controls. There is plenty of headroom and with a quality headphone amp these can be cranked up without distortion (usual safety warning applies). Though Pioneer has the Dance music producer in mind, these will fit any type of audio work ably, be it recording, mixing or post-production (the low frequency handling will be of use here). The balance between durability and comfort is good and will suit headphone-heavy work practices. The clarity and dynamic detail available to the listener is impressive, though this will in part be determined by the quality of amplifier. Our one caveat is the high frequency focus which doesn't suit our hearing, but it might suit yours. These are serious headphones at a price where quality is expected.